Halloween Pumpkin Deviled Eggs are totally cute, fit the occasion perfectly and taste great, too! 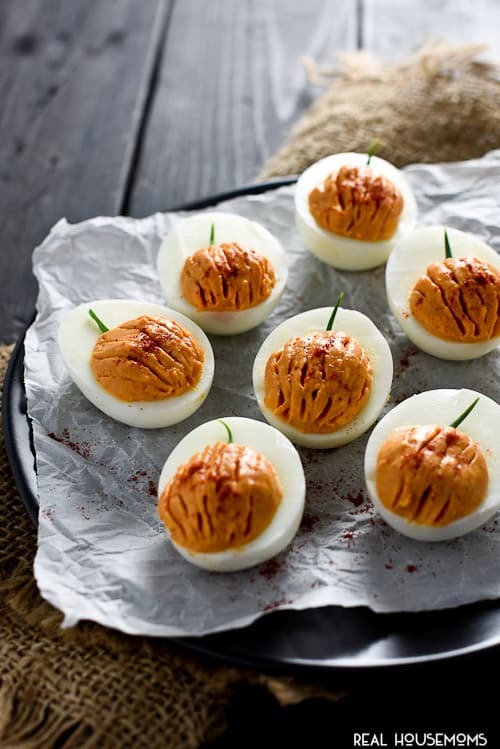 Every Halloween party needs some cute and delicious themed food. To be honest though, most of the Halloween appetizers I see are just too gory for me. I want the appies to be themed, but I still want to be able to eat them. 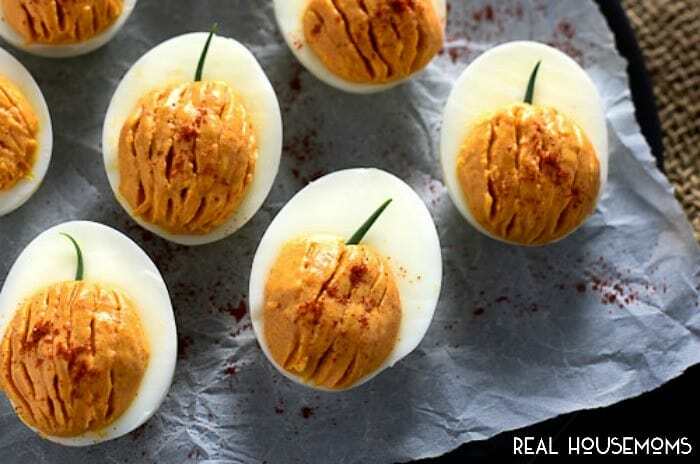 Maybe I’m a wimp, but I don’t want to eat blood and guts..
I’ve added some real pumpkin into the deviled eggs; it just seemed like the right thing to do. Even though pumpkin and eggs might sound like a strange combo, the flavor is light and works quite well. 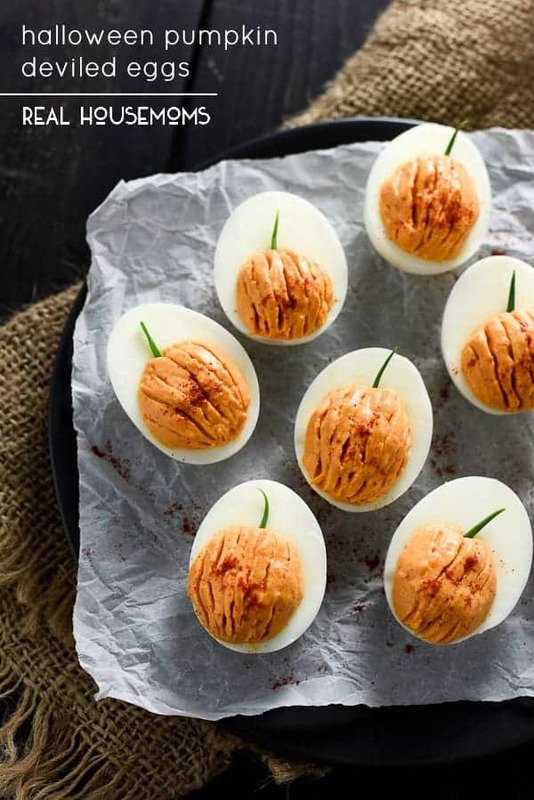 I had originally wanted to do something like these crazy delicious Bacon Deviled Eggs with Caramelized Onions and Cheddar Cheese, but in the end decided that pumpkin in pumpkin deviled eggs was just too fun to pass up. Add the baking soda to a medium sized pot over high heat and bring it to a boil. Add the eggs and let them boil for 6 minutes. Remove the eggs from the pot and place them in a bowl with cold water. Let them cool completely. Carefully remove the shell from the eggs then rinse the eggs under cold running water to make sure there are no small pieces of shell left on them. Cut the eggs in half, scoop out the yolks and add them to a small bowl. Add the remaining ingredients to the yolks and mix together well. Add the yolks back into the eggs and smooth the tops with a damp finger. Use a toothpick to draw on the lines of the pumpkin, add a small piece of green onion for the pumpkin stem and lightly sprinkle the pumpkin with smoked paprika. Him, I'm Kristen. I'm a recipe developer, food photographer, and chef at a small, underground restaurant. I love creating simple, healthy, and (most importantly) delicious recipes for you to share with your friends and family. Be sure to stop by The Endless Meal for lots of recipe inspiration. Oh my. These are adorable! Thank you so much, Whitni!